What made you want to open a business in Williston? So many of my earliest childhood memories stem from strolling the downtown streets of Williston with my mom during the Christmas season. Whether it be sitting along the counter of Woolworth’s in the early 80’s, watching free holiday movie’s (Prancer was my favorite) at the theater every Saturday through December in the late 80’s and early 90’s, or eating the yummiest .99 cent cheeseburger from the Castle Café one night a week in the 00’s. All of these memories created an intense urge to someday come back and open my own place downtown and create memories for others to enjoy. How does shopping locally impact the community and the people around you? The reasons to shop local are endless, but to me, three reasons really stand out. First, it keeps your tax dollars within the community for things such as street repair, community beautification, trash collection, first responder protection, etc. This is vital in any community and without it, we would be in trouble. Second, local businesses have a vested interest in their store, so they tend to work harder and make decisions based on customer feedback. This builds a unique relationship amongst owners, customers and the community. Third, customer service tends to be far superior in locally owned stores. Often times, prices are a little higher due to smaller orders and larger overhead expenses, so making sure every person that comes through the door has an amazing experience is vital. Employees are trained in more thoroughly and everyone tends to be more knowledgeable about the products they carry creating customer service that can usually not be matched. How has owning a small business in Williston given you opportunities to give back to your community? Owning a small business has so many perks. Besides being able to give in the literal sense through donations and silent auction items, we are also able to educate people on alternative health and wellness options on a daily basis. People often come in during very hard moments in their life and are in need of something that they cannot find anywhere else. For them to share some of their most personal and emotional life moments with us is incredibly touching and when they come back because something really worked for them, that is even better. The Williston Community offers a lot of opportunity. It young and vibrant. This is the community I have chosen to raise my family in, and I want to make this the best community for my children and for the many generations to come. Local businesses and the community go hand in hand. First; Local businesses rely on the residents. In turn, the businesses also need to offer the residents the reason to keep their dollars local. There are many hidden gems in this community that offer unique products. They offer a uniqueness that online competitors can’t. It’s the uniqueness that will develop a city’s character. 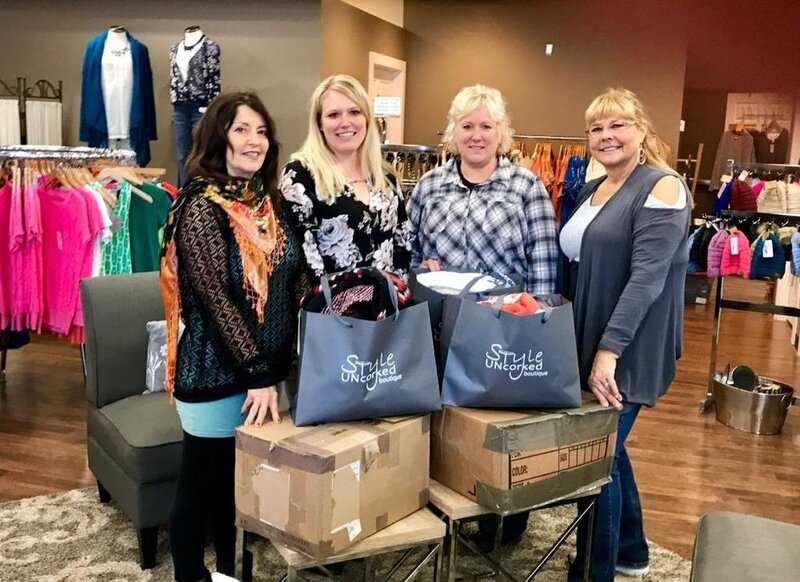 Style Uncorked has given back to many non-profit organization in Williston through the Shop for a Cause program. It allows organizations to designate a day and when customers checkout they mention that organization and we give 20% of that sale back to that organization. We also gave Williston’s female first responders $40 to spend in the store as way of saying Thank You for keeping our customers safe during the Hedricks Fire. It's my home town. I've always wanted to own a business so when the opportunity presented itself, I jumped at it. Growing market, great people, and a great place to live made it an easy decision to move back. Keeping the money here, along with attracting other people to spend money in our community, will only help us grow and add more business that this town desperately needs in my opinion. Stores that meet everyones interests and hobbies such as Scheels, Target, and American Eagle will create more jobs that are desired for individuals who do not want to work in the oil patch; whether it is for full time students needing part time jobs or parents needing full time jobs. Wages will stay competitive which will help individuals live more comfortably. Williston will be a place to visit and enjoy. It has provided financial stability to be able to donate to organizations such as WHS, Special Olympics, and other surrounding schools. Not only do I give back financially; I also volunteer my staff to give their time when needed. Last year we grilled at a baseball game for Williston which was a very good turn out. This year we volunteered to have a booth at the local Farmers Market and supplied everything needed for the kids to tie-dye shirts. The most rewarding part of giving back is being able to see the ones on the receiving end enjoy it. Our first restaurant venture was Outlaws' Bar & Grill in Watford City, ND and we wanted to expand our Six Shooter Restaurant Group to the Williston area, which has to grown to be an extension of our home. Supporting the local community is incredibly important to the success and well-being of the people around us. It's something we take pride in with our business, and as private citizens of the community. Owning a small business in Williston has opened the doors to a multitude of opportunities - from being able to personally connect with the backbone of the agriculture and oil industries, supporting events like the Bakken XTrek and local softball teams via sponsorships, to participation of the Trail of Treats, to discounts for firefighters and members of the military. We recognize the importance of community involvement from all levels and allow our employees to take the time to be involved with local committees, charities and events. I initially opened a business in Williston because I missed working in the retail industry and in the midst of the boom we were still lacking in retail shopping options for this area. Shopping locally impacts the community and the people around me because the tax dollars spent when purchasing locally go back into our city and state in addition to the income made by myself and employees goes back into our churches, school fundraisers, newspapers, sporting activities, coffee shops and many other of life's expenses. Owning a small business has been especially rewarding when it comes to giving back to the community I grew up in! There are a number of regular fundraisers and events that our community looks for businesses to contribute financial or for door prizes and baskets. It allows me to be a part of something much bigger than myself with all of the great things the people of this community do for each other! I hope that is a small reason for "Willistonites" to consider shopping local before going on the internet to make their next purchase. It becomes a "happy little circle" of commerce when people shop locally and Little Muddy Gifts or other local businesses can turn around and contribute back to the community that supports us!